So imagine yourself in a beautiful vineyard at a wine tasting enjoying one of the most amazing wines you have had in years. It sounds like paradise right? It is! You then learn from the vineyard owner that they have a very small annual production and the wine is not exported; as a matter of fact the wine is only sold locally right here at the vineyard in Mendoza Argentina. Oh no!!! Sadly this scenario has become a common problem for me traveling around the world and discovering some of the very best wines are not exported. After 10 years I still crave a wine from Stellenbosch South Africa. How do you bring home these amazing wines? Ship it from the vineyard directly to your home. This is an option that most larger vineyards provide however there are additional fees involved and it can get quite pricey quickly. Buy it and then ship it yourself from a local post office. This is usually a good option but does require some additional effort on your part and ideally you have a rental car to transport the wine. It make take several weeks for your wine to arrive at your home and I would not recommend doing this with expensive wine. Buy it and pack it in your suitcase. My favorite choice! I have successfully transported wine from over a dozen countries as far away as Australia and South Africa. 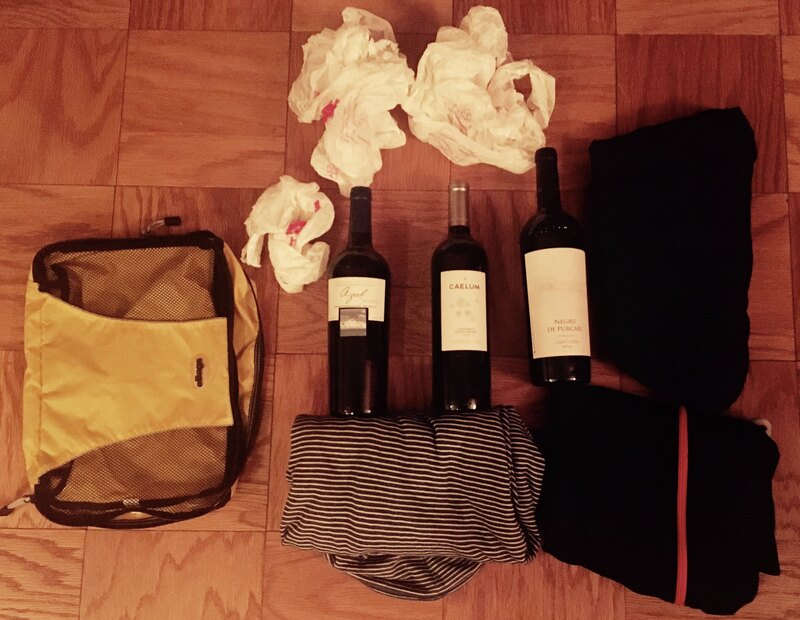 How to pack wine in your checked luggage? Let me start by saying that I have NEVER had a bottle of wine break in my suitcase. I have packed up to 10 bottles into a medium roller board suitcase with no issues. I sadly cannot guarantee your success of course but I have followed these simple steps dozens of times. Utilize a t-shirt (or any clothing item) to wrap around the bottle of wine; wrapping like a present. Place the wrapped wine bottle into a plastic carrier bag or ideally large ziplock bag to avoid any clinking. Put the plastic bag that contains the bottle into a medium packing cube. Repeat the process for 2 additional bottles of wine that will all fit firmly into one medium packing cube. In the event that you have less than 3 bottles continue to fill the packing cube with additional clothes until firmly packed. I recommend putting your shoes on the bottom of the suit case for extra protection; then load the packing cubes on top. That’s it! Get home and enjoy some amazing wine! Reminder: Check the customs policies for your home country. In many countries you are allowed 3 bottles duty free but if you bring more just declare it on your customs form. There may be a small tax but well worth the price of amazing wine! 5 must have items for every travel day bag! All trips are unique and will require something different to be carried in your day bag. However after 60 plus countries around the world these 5 items are always in my day travel bag regardless of where I am traveling. In a prevoius post I wrote about “5 must have items for any flight!” and today let’s consider what you should be carrying with you before you leave your hotel for any adventure. Water bottle: I personally drink a lot of water and always have a bottle with me regardless of the situation. I could be traveling around a big city or in the rainforest no exceptions; there I am carrying a water bottle. You could bring your own water filter but I always take a flat packable water bottle to refill. Note pad & pen: This has been extremely helpful in international travel to write down the name and address of the destination we are going to as my pronunciation may not always be perfect. Just grab the one from your hotel room before you head out for the day. Headache & Pain Relief Tablets: There is nothing worse than being on a vacation that you have waited months for and not feeling well! I always carry 2-6 tablets with me in a teeny tiny plastic bag in case I get a headache, tummy ache or etc. Baby wipes: Not just for babies anymore. These really should be called “magic wipes” as they resolve so many travel needs from washing your hands, toilet paper substitute, getting dirt off clothes and cleaning leather shoes. Collapsible shopping bag: This is critical. You may have absolutely no intentions of buying anything while you are out for the day. Yet somehow you end up unexpectedly at a local market or artisans fair. In many countries you have to purchase a bag to take your purchases home; so bring your own! I personally have been utilizing the same set of Envirosax bags for daily shopping for over 7 years now and they are still in great condition.